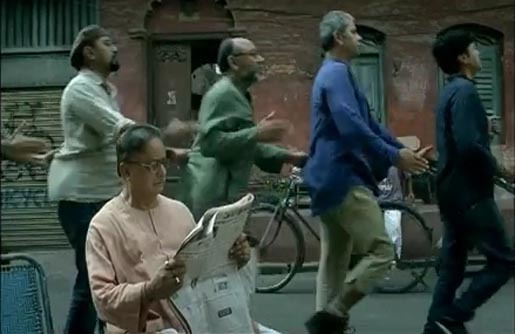 Indian Railways used the Commonwealth Games as an opportunity to run their first television commercial, showing a human train of men running through the streets and buildings of Kolkata. The Desh ka Mel train appears in two 60-second TV ads with the lines, “The Magic of India, Indian Railways” and “Desh Ka Mel, Bharatiya Rail”, debuting during the Commonwealth Games opening ceremony, shown in India, Australia, New Zealand and South Africa. The Human Train campaign was developed at Ogilvy & Mather Delhi by executive creative directors Piyush Pandey, Ajay Gahlaut, copywriter Heeral Akhaury, art director Sukesh Nayak, account manager Ravi Adhikari. Music is an adaptation of “Rail gaadi chhuk chhuk chhuk chhuk”, from the 1968 Ashok Kumar film Aashirwaad.